Carmi hosts Thematic Photographic and the theme this week is “angles”. Shot yesterday at Fenway Park with my camera phone, using a strange angle, because it made the best picture. 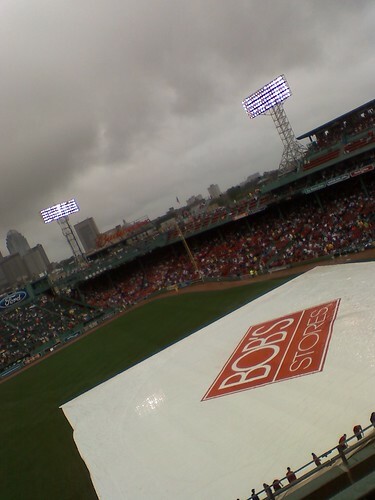 Despite the impending doom and gloom, the Red Sox/Yankees game was only delayed about an hour. I tell ya, tho…those guys whose job it is to cover the field sure got a workout yesterday! They must’ve covered and uncovered it about eight times! I’m pretty sure they did that all weekend long! Their arms have got to be sore today! This is such a cool shot, by the way. I sure hope your seats were covered! Very cool shot! My camera on my phone $ucks. I can upgrade in Dec. I might have to get me another phone. Yep, those ground cover guys can really MOVE!